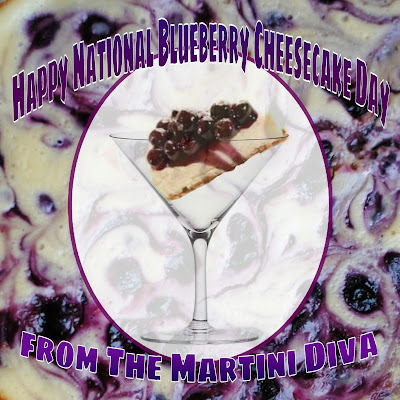 It's NATIONAL BLUEBERRY CHEESECAKE DAY - Stick that in a martini glass! To start off your Memorial Day Weekend with a blast - how about a blast of blueberries?? Garnish: Half a dozen blueberries, hollowed out and filled with cream cheese frosting. In the bottom of the cocktail shaker muddle the blueberries with the lime juice. Fill a cocktail shaker with ice then add the remaining ingredients and shake until chilled. May 26th is National Blueberry Cheesecake Day!